Choosing a car seat for your baby is usually pretty easy, as there are only a few options. Infants have to sit in a rear-facing, infant-only car seat (with a carrier that sits on a base), or a rear-facing, convertible car seat. Forward-facing toddler car seats — Can only be used facing forward and with a harness strap; appropriate for children until they are 40 to 80 pounds. Convertible car seats — Can be used in the rear-facing position until a child is 35 to 45 pounds, then converted to a forward-facing car seat once a toddler is two years old. Combination car seats — Can be used as a forward-facing car seat with a harness strap until a child is 40 to 65 pounds, then as a booster seat. In addition to there being more types of car seats to choose from for their toddler, parents may also be confused about the safest way for their toddler to ride. The latest car seat guidelines state that all infants and toddlers should ride rear-facing until they are at least two years old or until they reach the highest weight or height limits for their car seat. That doesn't mean that you should necessarily switch your toddler forward-facing just because he reaches the weight or height limits of your rear-facing infant carrier, though. Instead, it might be best to continue rear-facing in a convertible car seat. Also, some smaller toddlers may be safest riding rear-facing even after they are two years old if they haven't yet met the maximum weight or height limits of their rear-facing car seat. In fact, the recommendations from the National Highway Traffic Safety Administration are that kids should ride rear-facing and until they are 1 to 3 years old, as "It’s the best way to keep him or her safe." All of this means that your toddler should be able to ride in the rear-facing position well into her second or third year if she is in a convertible car seat, which often has a rear-facing weight limit of 40 to 50 pounds. 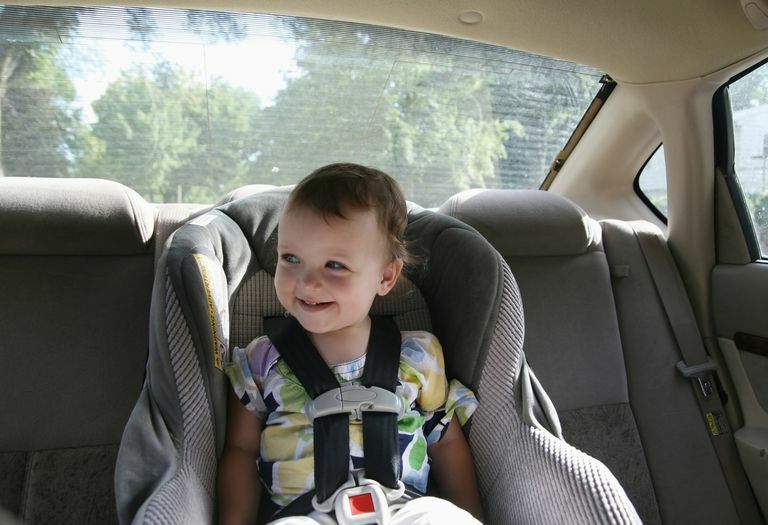 If rear-facing is safest, then why don't more parents keep their toddlers in this position in the car? It is usually because they either think their toddler won't like it or because they feel like they can't see their child when he is rear-facing. Neither, however, is more important than a toddler's safety. And yes, you can keep your toddler rear facing even if their feet hit the back seat. According to the AAP, "Children can bend their legs easily and will be comfortable in a rear-facing seat. Injuries to the legs are very rare for children facing the rear." American Academy of Pediatrics. Car Seats: Product Listing for 2016. Marilyn J. Bull and Dennis R. Durbin. Rear-Facing Car Safety Seats: Getting the Message Right. Pediatrics, Mar 2008; 121: 619 - 620.